The time to take control of career has arrived! The individuals who are successful in their career are the ones who have taken charge of their career and mend things to have the full ownership on their career. Such individuals deny waiting and seek their options themselves. They do not depend on others to direct them as to what has to be done. Instead, they seize hold of their own thoughts, dreams and passions and develop the most successful career. 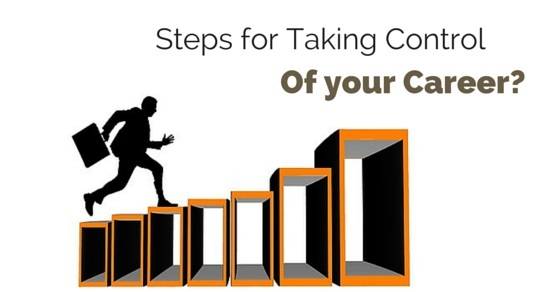 How to Take Control of Your Career? Identify your goals and set them which you want to accomplish over the course of your prospects. It is essential to set goals for a successful career. Additionally for controlling your career a basic set of goals should be added to your bucket list. It keeps you motivated and enthusiastic that way. When you are assertive of what you need and you want, you have the power. Contemplate what makes you hold back from asking what you deserve, or taking advantage of opportunities that can aid for success. Ponder about under what conditions or scenarios you become nervous. Review your performance by talking to the employers or managers or speak to mentor about your work review. Whether it needs learning how to cooperate, overcoming fear of public speaking, or taking a professional risk, it’s time to get out of your comfort zone. Firstly you have to construct a plan and structure. Decide where you need to reach and choose a path accordingly. Some of the great successful beings set up a long term plan and some stick to planning every week that means short term plan. Be flexible with these plans as career may turn out unexpected and plans may need some alterations. A plan is like the blueprint for a career’s success. Seek a guide that has experience in the same path as yours. The mentor will guide through the process of success and advice regarding adversaries and difficulties. A mentor is someone who can give sincere and truthful feedback and who you can trust. A mentor should invest the knowledge he has of the profession to you and bring out the best in you. He should be able to recommend good plans for successful career. Forming a strong relationship with key shareholders and network of employers helps in taking the career to another level. They can be people internal to the organization where one works or external links. They are capable of providing you with necessary recommendations and referrals which will prove beneficial for future. It opens a whole new option for the prospect. Strong networks can help in the inclination of the career. As you form relationships and develop a plan, you must also have a rigid insight of your skills and experience required to reach your ultimate objective. Ask from your mentor what skills will be required as well as the shareholders and stakeholders can also provide with this knowledge. Then find out what training, revelation, or other coursework you need to get for the required development and progress. Look for the experiences you need to come across and take the necessary steps to develop experiences. Always keep in mind you are trying to control your career for higher growth. You should strive to stand out from the crowd. Having control refers to having adequate acceleration to reach opportunities and establish success. To conquer this, you must execute beyond expectations, take the complex and at times unwelcoming course works and even take the occasional assignment which is outside your comfort zone. By illustrating your ability to be successful outside your comfort zone, outshining in complicated roles and consistently performing beyond potentials, you will stand out from rest. Indeed you need to get out and away from your daily routine and spend a contemplative and meditative time. Take someone with you if possible who can advice and facilitate you. It can be your mentor too. Think positively regarding all your future plans and let the facilitator help you put more stress to come up with new ideas. Try and focus on strengths rather swamp over weaknesses. Identify chances and openings to a greater opportunity which looks promising. Pay attention and focus to bring your career under control on occasions that leads you to the best break. Go through the trends and find new ones that have emerged in your industry of profession. Develop accordingly so that you are not staying back but staying update. Have an eagle’s eye to spot the latest and available chances. At times you need to ask for what you want. An opportunity cannot come by your side by itself, once you spot it you got to grab a hold of it. Express your goals and illustrate your skills in order to demonstrate that you have what it takes. Get involved with a plan of achievement. And thus ask for what you want before it is too late. Know the company and industry you work for in and out. Read the newspaper or company’s newsletters. You may encounter few threats which you need to be prepared for beforehand. You cannot wait for a company to close down and then search for another job. You need to search the next job as soon as the news of any such closure arrives. Be flexible to change and mend your career plans as per threats and situation. Handling involves not panicking over your career’s situation. To start and feel like you own your career, stay calm. When you stay calm, positive attitude comes along. It is essential for decision making and coming to a satisfactory conclusion. Worrying and letting negative thoughts hover may cause stress and further deteriorate your career. Find the right place in the organization. Gather together strategic associates, resolve personal conflicts with fellow workers, identify supporting sensitivities, understand the rules and norms of your business, know when to join forces and when to compete with someone, and sweep away the barriers that have prevented you from flourishing on the job. All these will help you become comfortable and coexist. It will bring a new sense of optimism and add to your confidence. Recognize who you are, what associates think you are, and resolve these contradictions. Identify your functions and tags. Attempt to resolve the contradictions concerning whom you believe yourself to be and who people think you are. You will discover your authentic self and real personality. These help in overcoming future contradictions and prosper with support of the associates. In order to rise in the career and control it you have to cuddle with changes and not reject or oppose certain alterations. Take the challenge as another goal to be fulfilled. Exert yourself to understand distinct cultural assistance and consent them through smooth progress of working with diversity. Ironically, this facilitates self comprehension and lets you grow. When you work the job becomes a mutual association. Express your concerns regarding something and be open about what methods you will like to apply to progress. Ask for an elevation in your position if you feel you deserve one. When doing so have a list of your achievements of the works you have excelled in. If you have been slogging and feel dreaded by the menial work, remember you have only one life and you need to make the most of it. So it is not worth wasting for a job you have been miserable in. We have been exerting ourselves 9 to 5 and more with globalization and the statistics attest to this that most have been sleepwalking to their works. You need to take charge of this and break the habit. This job is the path through which you are going to make a successful career. If you hate it, you will not be able to touch success. Analyze each tasks you handle deliberate to understand which work excites you and which does not. With the work that excites you go above and past with it. If the slogging continues and you are stuck in the 9 to 5 trial, it may be the time to think about career transition. Do a SWOT analysis with these steps too, strength, weaknesses, opportunities and threats. Understand and comprehend your own career with these factors as for any company also, this is the basic analysis done for prospective growth. You can hold your career’s reigns and it can be anything you want it to be. It belongs to you and you can make it grow and develop as best suits you. As if you exercise these steps, you will achieve the maximum height of success throughout your career.